The same technology applies to both women’s and men’s golf clubs, but the ladies’ clubs are shorter, less heavy and much more flexible. The differences come in due to the smaller stature and slower swinging speed of women, allowing them to make the most out of the clubs. Both female and male golfers need consistent swings that are able to create firm and solid contact with the balls. However, both sexes have different body structures and mechanics which require different sets of clubs to perform the same task. The same way golfers have varying clubs for the different shots needed, women and men have different clubs that support each party in playing. What is Men’s Golf Clubs? The men’s gold club is a club that is structured to suit the male’s structure and game play ability. The men’s club has a heavy head with a strong shaft. It also features standard sized woods and iron rods. The standard length for men’s golf club steel 1 type iron shaft is 39.5 inches, and for steel 2 type iron shaft is 39 inches, which is difference of ½ inches, consequently, steel 3, iron is 38.5 inches, and steel 6 iron, is 37.5 inches. This as well applies to graphite iron shaft with graphite 1 type iron shaft measure at 40 inches and graphite 3 type iron shaft measure at 39 inches. The length of men’s golf club wedges standard length is measure at 35 inches for steel wedges, and 35.5 inches for graphite edges. The standard men’s driver varies from 9 to 11 degrees, which is an average of 44 inches for steel driver and an average of 44.5 inches for graphite driver. While steel 3, 4, 5, type of woods is measure at 42.5, 42, 41.5 inches respectively, and the 7 and 9 steel type of woods share the same unit, 41 inches. While the graphite 3, 4, 5, type of woods is measure at 43, 42.5, and 41.5 inches respectively, and the graphite 7 and 9 type of woods have the same units, 41.5 inches. The standard grip of men’s club is longer in length. These standard measurements ensure to make optimal swinging speed and accuracy on the golf course. However, there are few exceptions to these standard measurements, in a situation where the user is shorter or taller than the standard length; such an individual might consider custom length golf clubs. Thes have to however, pass approvals before being allowed in serious competitions. 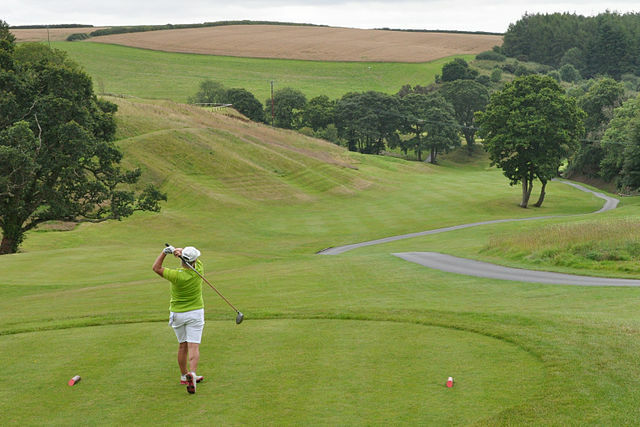 What is Women’s Golf Club? 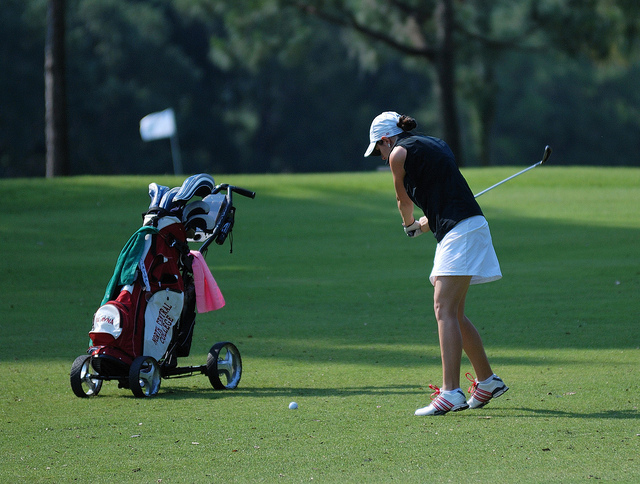 Women’s golf clubs are similar to the standard golf club, but with little variations in size to accommodate the average women’s swing speed and height. For instance, the average length for women’s steel and graphite woods has a difference of 1 inch from the men’s steel and graphite woods. Which means the standard measurement for women’s 3, 4, 5, steel type of wood is at 41.5, 41, and 40.5 inches respectively, also the women’s graphite 3, 4, 5, type of wood is measure at 42, 41.5, 40.5 inches respectively. And the women’s club wood has high loft of 12-13 degrees. The average measurement for women’s steel type 1 and 2 iron shafts is measure at 38.5 inches and 38 inches respectively, which is less of standard measurement of men’s steel iron shaft by 1 inch. So the steel 6 iron shaft would be measure at 36.5 inches. In the same vein, graphite type 1, 2 and 3 iron shaft is measured at 39 inches, 38.5 and 38 inches respectively. The women standard length of steel wedges is measured at 34 inches and graphite is measured at 34.5 inches. The women’s hands are too small in size to have a proper grip, which, thus, necessitates the design of women’s grip, relatively smaller in diameter to allow an appropriate grip. The adjustment in the general standard measurements for women’s golf club is however necessary, for women are relatively shorter with less strength compared to men. A standard women’s shaft is more flexible compared to the men’s shaft to cater for slower swing speeds popular with women. The women’s shaft is made of graphite which makes it lighter than the men’s which can be made of either steel or graphite. Women’s driver is lighter compared to the men’s driver, and the women’s driver is less than 1 inch in comparison to the men’s driver. Women’s grip is small in size compared to men’s grip size. The smaller grip size of women’s golf club, permits a firmer grip. The women’s wood shaft standard measurement is different from the men’s standard measurement by an inch, and varying degrees of loft. The women’s iron shaft quite differs from the men’s iron shaft by 1 inch, so to support softer flex iron. The men’s club head are relatively higher than the women’s club head. The weight of the women’s golf club is much lighter than that of the men’s. The same regulations apply in both men’s and women’s golf clubs. Both golf clubs are made with the same materials though differs in size. The standard measurement of the iron, driver and woods shaft of men’s and women’s golf club differs by 1 inch. The men’s club head is heavier than the women’s club head. Evah Kungu. 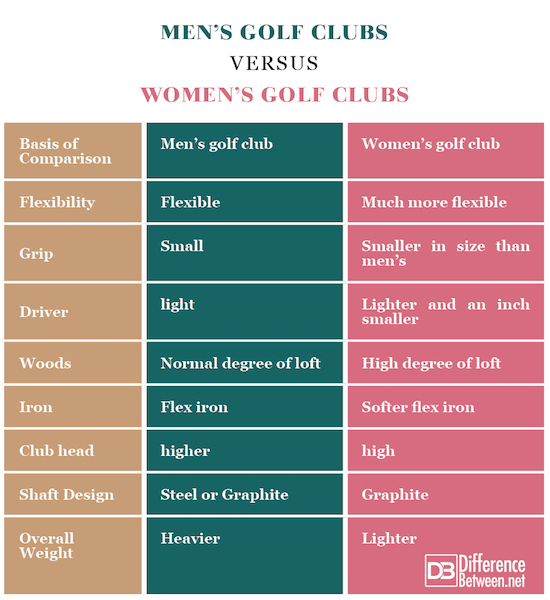 "Difference Between Men’s and Women’s Golf Clubs." DifferenceBetween.net. June 7, 2018 < http://www.differencebetween.net/miscellaneous/sports-miscellaneous/difference-between-mens-and-womens-golf-clubs/ >. Crosset, T. W. (1995). Outsiders in the Clubhouse: The World of the Women’s Professional Golf. SUNY Press. Howell, M., Howell, R., and David W. “The Sporting Image, A pictorial history of Queenslanders at play”. Brisbane: University of Queensland Press. ISBN 0-7022-2206-2, 1989. USGA rules of golf. “Rules limited and the United States Golf Association”, 2015. https://www.usga.org/content/dam/usga/pdf/2015/2016%20Rules/2016-rulesofgolf-USGAfinal.pdf. Retrieved 2018-05-28.